I have been hating our master bath since we moved here. No longer. David has nixed painting anything but the living room and though it bums me out, I've learned to deal with it. So, while I would love to have a beautiful hue in this bathroom it just isn't going to happen. Plus, cash is slim right now so I had to do with what I could find. 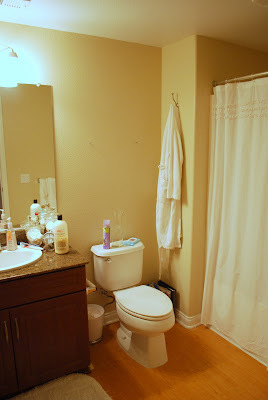 We originally had a white shower curtain, nothing on the walls, white towels (which I personally love to use) and a white rug. Yes, lots of white. Lots of boring. Here's a problem I have since moving to San Diego. I'm used to shopping at the likes of Home Goods, Last Chance and second hand stores in Arizona for my home decor and I've been upset thinking that the high cost of living here would translate over to the cost of decorating as well. Long story short: I forgot about Ross. On Friday I stopped off at the Farmer's Market by my house after work (big disappointment), then Michael's for a few Halloween decorations (next post to come) and then almost drove right on past the Ross next to my house. I thought, "Hey, it's been a while and maybe they'll have one or two things that I could use to spruce up the place." Then I happened upon this shower curtain - at least I was pretty sure it was a shower curtain. It was a pretty shade, kind of a mint green, with a floral pattern but it wasn't packaged and had no price tag on it. I took it to the cashier and decided that if it cost less than $10 I would buy it, even just for the fabric. Well, that cashier gave it to me for $5 and as soon as I hung it up in the bathroom I was thrilled. It matched my rug (from another room) perfectly. 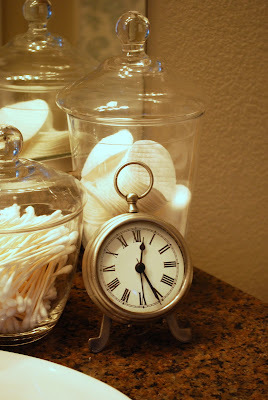 I already had this little clock that my sister gave me from Pottery Barn and I purchased a few glass jars with lids from Michael's and voila! It looks infinitely better and costs only around $10 for the new items. Disclaimer: these pictures are wretched because I can't figure out lighting very well on my camera. It looks amazing. I love the shelf. I have been debating what to do with the space above our guest bathroom toilet and now I know what to do. And I LOVE Ross as well. You have great taste. Cute! You definitely have a flair for decorating, Liz! You have great vision with the great buys you find. I really love your style! Hey! Don't diss white towels and accessories! 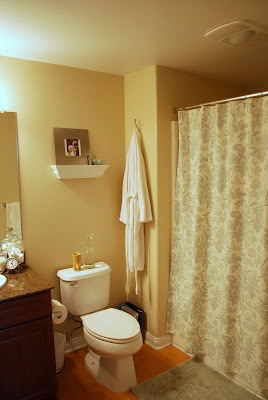 I've been switching all my color and pattern towels in favor of white towels. Being able to bleach those suckers is a lifesaver! I love it. Sean won't let me paint either. Oh there is a Home Goods in Orange County but that is a bit of a drive with the traffic. I am all for white towels! They go with everything, and you can bleach them if they get smelly. 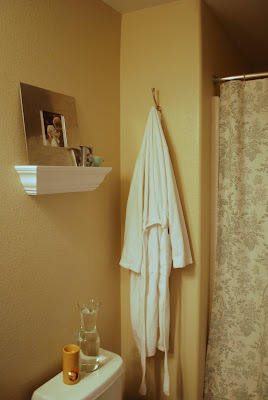 I love the shower curtain and the little shelf. You have a flair for decorating. I also think your nursery is so sweet and perfect. You did a fabulous job. I was checking your blog to see if you had your baby last night. I wanted to let you know that there is a Home Goods in Poway and Encinitas. A 20-30 min. drive but worth it.